I had the pleasure of reviewing Organic Palm Shortening by Tropical Traditions. I've been enjoying the products of Tropical Traditions for a while now. They are one of my favorite companies online! I believe their coconut oil is the best. You can read more about the coconut oil here. Trying their shortening was interesting. When I opened the container, I immediately noticed the whipped look of the product. I also noticed that it wasn't bleachy white. Instead, it had a pleasant, natural off-white color. I used it for frying a few times,in recipes calling for either butter or shortening, and the biggest test of all- PIE CRUST. I'm pleased to report that it was wonderful in every recipe. This is an excellent product. I fried my Okra Fritters in the Organic Palm Shortening. I mentioned that I made a pie crust with this shortening. It crisped up beautifully, and had no greasy taste. Here is a picture of that beautiful apple pie. The pie disappeared so quickly that I didn't have a chance to photograph it! 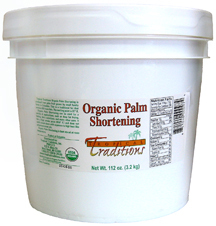 The good people at Tropical Traditions have allowed me to have a giveaway of their Organic Palm Shortening. There are two main requirements for entry and a few ways to get extra entries. 1.Subscribe to the Tropical Traditions Newsletter. 4. "Like" Tropical Traditions on Facebook. 5. Follow TT on Pinterest. 6. Follow TT on Google +. 7. Visit the Special Deals Section of Tropical Traditions. 8. Check out Free Coconut Oil. Please leave me one comment with the numbers of the things you have done from the list above. Each one equals one entry. I will draw for this giveaway on November 23th at midnight EST. I subscribe to the Tropical Traditions newsletter (aneesa824 @ yahoo dot com). I follow you on GFC (Aneesa Bint Lewis). I follow Tropical Traditions on Twitter (@Aneesa Lewis1). I like Tropical Traditions on Facebook (Aneesa Bint Lewis). I follow Tropical Traditions on Pinterest (Aneesa Lewis). I follow Tropical Traditions on Google+ (Ummu Adillah). I checked out the Free Coconut Oil site! ha! you got me on the pie. I did 1,2,4, and 7.... And I LOVE Palm Shortening!!! Thanks for the wonderful giveaway!!! I visited the special Deals Section of Tropical Traditions. I visited Free Coconut Oil. I didn't know that I could get $50 for a coconut oil recipe! I've got several. I follow TT on pinterest. I did seven of the things on the list, for seven entries. Thanks for the giveaway! I did #1, 2, 7 and 8 for a total of four entries. I did 1,2,4 and 7. Thanks for the introduction to palm shortening. I think I did them all!!! Would love to win!! I follow both TT accounts on Twitter. I "Liked" Tropical Traditions on Facebook. I follow TT on Google +. I visited the Special Deals Section of Tropical Traditions and bookmarked! thanks! I also want the recipe for those okra fritters! I went to the Free Coconut Oil site. I am signed up for TT newsletter. And I follow Everyday Ruralty on GFC. I "liked" TT on fb. I went over to the Free Coconut Oil site. I did all of them, 1-8. I have never tried this product, but love the T.T. coconut oil. Thanks for the giveaway and good luck everyone. I did #1, 2, 3, 4, 7, and 8. I didn't know you could use the Tropical Traditions referral program without having a blog! I'm excited about that because I'm always telling people how awesome TT is!